whimsical water color illustrations, Bloom shows that the power of being humble and kind with a bit of mud and joy thrown in can show what a perfectly ordinary girl can do!" David Small is the Caldecott Award–winning illustrator of So You Want to Be President? by Judith St. George. He also received Caldecott Honors for The Gardener by Sarah Stewart and One Cool Friend by Toni Buzzeo. He’s illustrated dozens of other award-winning books, including That Book Woman by Heather Henson and The Underneath by Kathi Appelt, and lives in Michigan with his wife, Sarah Stewart. Cronin and Smallcombine talents in this fable for modern times: people who live in fragilekingdoms may need to get their hands dirty rebuilding. Bloom the mud fairylives in a glass kingdom where she turns weeds into blossoms and sand intoglass; she also leaves mud and cracks in the glass in her wake. As the kingdomgrows and gleams, folks protest Bloom's mess. She takes to the forest, butwithout her, the kingdom deteriorates. When the royals seek Bloom's magic tosave them, they are outraged when the dirty creature places a bucket of mud attheir feet. So they send tiny, ordinary Genevieve to talk to Bloom. AlthoughGenevieve has heretofore preserved her delicate hands for the frivolous task ofwashing the queen's sugar spoon, with Bloom's coaching she digs her hands intothe mud to make...bricks! The text is set in different typefaces and fonts tohelp the narrative along, while Small uses watercolor washes in cool blues andwarm greens and browns to indicate changing tones. Genevieve takes hernew-learned "magic" back to the kingdom to rebuild, and the residentsrejoice. All the characters, from royals to fairy, are white. The tale isenchanting but somewhat opaque, so metaphorical that children may needsignificant help from adults to understand it. If youngsters scratch theirheads, take them to the yard or community garden to plant and make mud pies. This smart, subversive fairy tale is set in a kingdom whose palace is made entirely of glass and whose inhabitants scorn dirt and untidiness. The kingdom was once home to a red-haired fairy named Bloom, whose magic could “spin sand into glass, turn weeds into blossoms, and grow a trickle of rainwater into a racing river.” But Bloom’s heavy steps and muddy footprints drew complaints, and she retired, exasperated, to the forest. Now, the king’s beautiful glass castle leaks, and everything else is “held together by tape, glue, and peasants.” Small’s (Glamourpuss) witty ink-and-wash drawings follow the king and queen as they enter the forest to search for the powerful fairy, but they refuse to believe that Bloom and the bucket of mud she proffers is the creature they seek. They dispatch their sweet servant girl Genevieve to locate her instead. Bloom questions Genevieve closely: “Why would the king and queen send a delicate child... to do something they could not?” she asks. “Because I am ordinary,” Genevieve confesses. Outraged that any girl would value herself so lightly, Bloom immediately begins Genevieve’s training in “magic”—up to their elbows in mud, the two make bricks and build a house. When Genevieve returns to the kingdom armed with new knowledge and spattered with mud, she thunders, “I am here!” Cronin (the Click, Clack, Moo books) juggles thematic elements with grace, mixing fairy-tale parody with maker tale and girl-power story to celebrate mess, chaos, and big plans. When seen up close, Cronin suggests, fairy-tale “magic” might really be no more than the willingness to get one’s hands dirty. When the glass castle starts shattering to pieces, the king knows just who to ask—Bloom, a helpful but messy fairy he once banished for leaving too many muddy tracks behind. When he finds Bloom in the woods, he asks for her magic, but all she shows him is a bucket of mud. Aghast, he decides to send an ordinary servant, Genevieve, to deal with her instead. At first, delicate Genevieve, too, is dismayed by Bloom’s love of mud. But soon, Bloom shows her its magic—it’s perfect for making bricks—and before long, they’re up to their elbows in it. Covered in dirt and grime, Genevieve returns to the glass castle with a solution that, though not dainty or tidy, is exactly what the king needs. 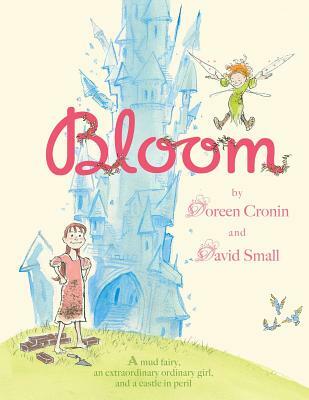 Small’s swirly ink-and-watercolor illustrations in soft pastel colors are full of comic details, and whenever Bloom is around, appropriately muddy splatters cover the page. In a charmingly old-fashioned tone that’s ideal for reading aloud, this ode to messiness reminds little ones that sometimes ordinary things are perfectly magical. HIGH-DEMAND BACKSTORY: Both Cronin and Small are award winners, and their team-up for this title should double its appeal. K-Gr 3–Though her outward appearance is chock-full of dirt,the fairy Bloom is delightfully talented. Underappreciated and misunderstood,she retreats into the wilderness. Without Bloom’s magical touch, her kingdomfalls into disarray, “held together by duct tape, glue, and peasants.” Thoughthe king and then the queen search for answers to fix their kingdom (“I amlooking for a magical creature, gone so many years ago”), they are too haughtyto understand the sprite’s message when she places mud at their feet. Aseemingly ordinary girl named Genevieve, whose only job in the kingdom is tocarry the queen’s delicate, unbreakable spoon, is next sent in their stead.Though initially puzzled by Bloom’s mannerisms, Genevieve learns from the fairyand develops the skills she needs to rebuild her kingdom Bloom’s inspiringoutlook (“Tell them there is no such thing as an ordinary girl”) paves the wayfor Genevieve to return home. Humor is laced throughout the charming narrative,highlighted through Genevieve’s dramatic growth and the expressive ink andwatercolor illustrations. Wavy, thin lines accentuate the ebb and flow ofBloom’s magical world. Changing typography emphasizes key ideas and naturalpauses within the story line. VERDICT This engaging, empoweringtale proves the future of happily ever after is in one own’s hands, regardlessof how much dirt they may have on them. This fairy tale for the modern era blooms with joy and delight. Bloom is a helpful but unusual fairy who lives in a glass kingdom. Misunderstood and under appreciated because she is muddy and noisy and sloppy, she leaves the kingdom for the forest. When the king is unable to convince her to return, it is up to the very ordinary maid Genevieve to visit Bloom and ultimately save the kingdom. The rich, descriptive vocabulary and clever dialogue enhance the story. The layout of the type and the lovely watercolor illustrations fill each page with magic.This book is a wonderful read-aloud that is fun and action-packed. It ends happily ever after, with a very positive message for children—that even the most ordinary among us can do extraordinary things. Theglass fairy kingdom where Bloom lives is beautiful, but its residents are dis-missive of her messy, muddy approach to magic, so Bloom takes her untidy ways(and her magic) elsewhere. After Bloom leaves, though, things fall apart—quiteliterally—until the kingdom is “held together by duct tape, glue, andpeasants.” The king and queen seek out Bloom for help, only to be perplexed andinsulted when she presents them with a bucket of mud. They then send meekGenevieve, a maid and “ordinary girl,” to do the job. The girl soon catches onto Bloom’s proposed solution—using the mud to make bricks with which to rebuildthe kingdom—and, after some instruction, practice, and reassurance by Bloom,the not-so-ordinary Genevieve returns to fix the kingdom: “She knocked on thepalace door and shat- tered it to pieces ‘I am here!’ she shouted.” This is anenjoyable original fairy tale, and young listeners will relish the youngheroine’s triumph over her royal elders. Genevieve’s literal shattering of theglass ceiling (okay, a door) tips slightly toward didacticism, but it’s ametaphor worth discussing, and while the ending is abrupt, it is also joyful.Small’s detailed ink and watercolor art balances the tidy restraint of thekingdom with the casual sprawl of the sprightly Bloom and the natural world.The evolving appearance of the auburn-haired Genevieve (she grows muddier andless demure in proportion to her increasing skill and confidence) alsoeffectively reflects her growing empowerment. Enjoy this as it stands or use itas a complement to Munsch’s The Paper Bag Princess.